One of the things I value at the annual Memorial Day Tribute ceremony at the Downey Cemetery is the time when we recognize veterans from different wars. When I first started attending the tribute a few years ago, there were a handful of World War II veterans. This year, there were just two. WWII is becoming further and further away from our memories, transitioning from something we have personally experienced into "history," something we learn about only from books and movies. Seventy years ago today was the "beginning of the end" of WWII in Europe, when the Allied forces invaded Normandy. 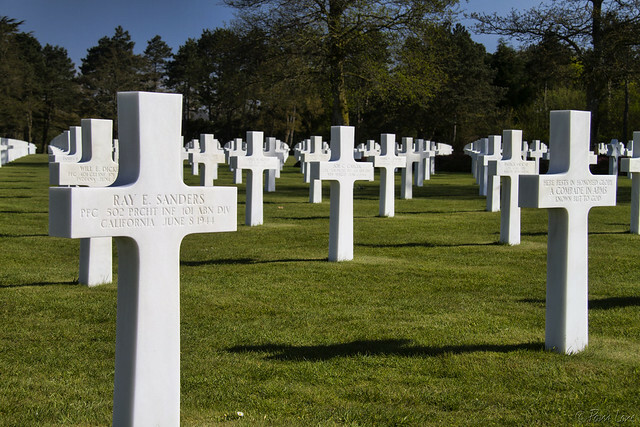 Last year, we visited the American cemetery, in Colleville-sur-Mer and saw the thousands of graves of Americans who died in the invasion. It's a good thing to keep the memory of that time alive, one way or the other. In the words of Rene Coty, President of the French Republic, "We do not forget, we shall never forget, the infinite debt of gratitude that we owe to those who have given all for our freedom."